The Exmoor pony is the oldest and purist of the British native pony breeds. The ponies have roamed the bleak, open moors of southwestern England, known as Exmoor, for centuries. They are believed to be the direct descendants of the horses that walked onto Britain before it was an island. Archaeological evidence dating back over 60,000 years bears an uncanny similarity to the Exmoor Pony of today. Natural selection has designed a pony suited to survival in a cold and wet climate without the provision of food or shelter by mankind. Two features unique to the breed are the hooded-eye, or heavy upper brow to protect the eyes from wind and rain, and the snow-chute, a group of short course hairs at the top of the tail designed to channel rain and snow down away from the body. The snow-chute, or ice-tail is shed each summer and regrown each Autumn. Their summer coat is sleek and shinny, but in winter they grow a double layered coat to provide both insulation and waterproofing enabling them to stand out in the worst of weather and remain dry at skin level. Exmoors are always brown with black points and show the characteristic mealy or buff colored ring around the eyes and muzzle. The forehead is very broad, the eyes large and pronounced, the ears small and the jaw deep. The body is deep and the ribs well sprung. The legs are short and clean with well developed joints and ample bone. The hooves are neat, hard, and well shaped. Their action is straight and true, showing no tendency to animation or sweeping. The preferred height range is 11.3 to 12.3 hands for stallions and geldings, and 11.2 to 12.2 hands for mares. Ponies weigh on average 700-800 pounds. The general appearance is that of balance, strength and definite pony character. Traditionally, Exmoors were used for herding and tending livestock on the moors but they are more than capable of competing, and winning in such disciplines as jumping, driving, dressage and long distance rides fr both adults and chidren. Their weight carrying capability for their size also makes them suitable for the disabled. Exmoors enjoy working, are quick learners and posses an almost cat-like ability to jump. First imported into North America (Canada) in the 1950s, the breed has remained virtually unheard of until the last 10-15 years. 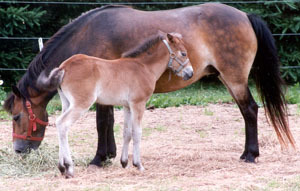 There are several herds of Exmoors throughout North America, and foal number are on the increase. 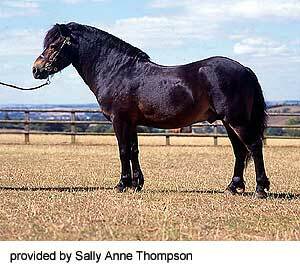 The Exmoor is a rare breed, there being only some 800 ponies globally and less than 40 Exmoors in North America.